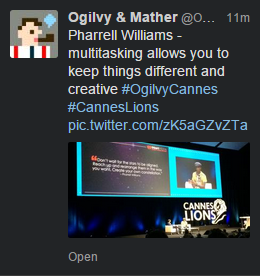 Not only has Pharrell Williams been speaking at Cannes Lions as if he is a philosopher. But Ogilvy & Mather’s Twitter account diligently shared it with the part of the world lucky enough not to be there. To provide some context. Ogily & Mather is the agency that was born out of David Ogilvy’s passion for clear and creative communication. Ogilvy is heralded as one of the greatest copywriters in the history of copywriting. Ogily & Mather also employs Rory Sutherland. Sutherland is a very clever and interesting man. If you need proof, watch one of his TED talks or read his book. And who wants to be the same? Different is so much better. In that case I’d better get multitasking. But wait, I’ve just remembered I read a book about this by someone who knows what they are talking about. Mastermind: How to Think Like Sherlock Holmes is a book by Maria Konnikova. The book is about mindfulness and how, if he were real, Sherlock Holmes would have thought and acted. Quite early on in the book, Konnikova addresses the theme of multitasking. We also know, more definitively than we ever have, that our brains are not built for multitasking — something that precludes mindfulness altogether. When we are forced to do multiple things at once, not only do we perform worse on all of them but our memory decreases and our general wellbeing suffers a palpable hit. To put this back in context, Maria Konnikova is a writer who specialises in psychology. Pharrell Williams makes pop songs for films with tiny yellow people. Both are very good at what they do. But I wouldn’t expect Ogilvy & Mather to tweet about Konnikova’s new song. It would probably sound like crap. A few years ago I was speaking with a friend. At the time he was preparing to save some money for an upcoming plan. In order to do so he had accepted that he needed to work hard in a job he wasn’t particularly fussed about. Naturally the conversation moved onto ways he could increase his income without changing his current situation. It just so happens that he is an incredible artist. Only a week prior to our conversation I had been admiring some of his artwork. Watercolour paintings of idyllic English country settings. The kind of thing that would hang inoffensively in most conservative, middle-class households. “Why don’t you sell your paintings?” I said. “But I am not an artist” he said. And there is the difference between types of people in the world. There are people who do things in order to be something. Then there are people (like my friend) who have to be something before they can do it. My friend had limited his outlook by deciding that in order to sell paintings he must be ‘an artist’. Except there is no such thing as ‘an artist’, there are just people who do art. My friend does art, he could quite easily sell it and call himself an artist. But he didn’t see it like that. He thought of it as a job. In order to sell art you have to be an artist. You had to be that thing in order to do it. Which is the correct way to do things? My friend went on to achieve his goal and now enjoys a very successful career. But then again, what better way to become something than to do it first? Want to be a manager in your company? Why not try managing people, then you will become a manager. Sometimes the best way to be something is to do it first. I was recently talking to someone who asked me, “what do you mean when you say that ‘ideas are more important than delivery?'”. It was in reference to a line on the about page of this website and was a good question. Finding myself in a tricky spot where the only exit was the exact shape and size of a well considered answer I had to engage my brain. It was based on my time spent studying and subsequently working at the University of Winchester with Chris Horrie who is always full of good ideas. Not only is Horrie always full of good ideas but he has an uncanny ability to side-step the awkward politics and difficulties that crop up with delivery. The result of this was that ideas were cherished and encouraged and delivery was believed to be a thing that would follow, one way or another. A solid idea craves delivery. Although my answer goes some way to describing why I used the ‘ideas are more important’ line on my about page, I don’t feel that it fully captures the essence of what I was getting at. It also risks writing off ‘delivery’ as not-so-important, but this is not the case. Good, solid delivery of a project will never be able to save a bad idea from failure. A good idea can survive shoddy delivery. That is why ideas are more important than delivery. Delivery can happen, there is always a way. Good ideas cannot be faked. You must work hard to own a good idea. A good example would be a client who I worked with some time ago. The client had an idea, it was to create a website that would provide a place for amateur creatives to publish their work, sell it, share it on other websites and the like. Not a bad idea but it was missing a couple of key things. 1. The client had no solid proof that there was an audience for this product. 2. The client had no pre-planned method of gathering a significant audience, instead opting for a ‘build it and they will come’ attitude. Fast forward a few months to the delivery of the project, a fine delivery at that. The website was delivered in the form of a technical masterpiece. Chock full of features, bells, whistles and empty database rows ready and waiting for creative work. Despite the great delivery and subsequent addition of new features, up-take on the site has been slow to say the least. The delivery followed the brief perfectly but the idea within the brief needed more time to brew. I am confident that the site in question will come good, all it needs is some good promotion, but that requires going back to the ideas stage. You can’t fake hard work at ideas stage. Delivery will always happen.